While Utah is famous for its featherlight powder, Deer Valley® is also known for its impeccably perfect grooming. Its Mountain Operations team has long held the belief that if it isn’t a bottomless powder day, you may as well be carving down the most velvety groomer you’ve skied in your life. This helps beginner and intermediate skiers too, who may not have the chops to float down a powder field but who are practicing their corduroy carving. Deer Valley’s team deploys a crew of 50 people every night, who spend 17 consecutive hours over the course of two shifts to manicure the mountain’s groomed runs and prepare them for the next day of skiing. They knock out the most important beginner-friendly trails and access runs first, then settle into the fun part: grooming the steeper blues and blacks to perfection with their giant, multi-ton, snowcat grooming machines. A crew of 50 spends 17 hours on the mountain each day to maintain the groomed trails. “At various points in the season, depending on the snowpack and snow temperature, we’re able to have a little more fun grooming runs we haven’t yet groomed that year—or can’t usually groom because conditions aren’t always right,” explains Steve Graff, director of mountain operations. These “fun runs” can include Evergreen, Orient Express, and Emerald, all located on the steep, rolling slopes of Bald Mountain. “It’s fun to offer our skiers something novel like that during the season—taking something that had a choppy or mogul-covered surface and smoothing it into perfect corduroy so they can soar down it,” Graff says. 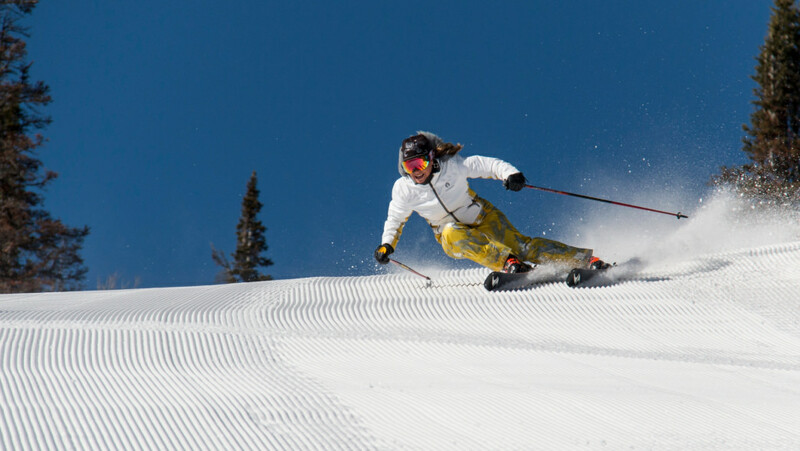 Beginners benefit from a large number of smooth cruising runs at Deer Valley Resort. Many Deer Valley guests are visiting families, with plenty of beginners both young and old. For this reason, the Mountain Operations team takes care to offer them a smooth, easy way down from almost every one of the resort’s six mountaintops. 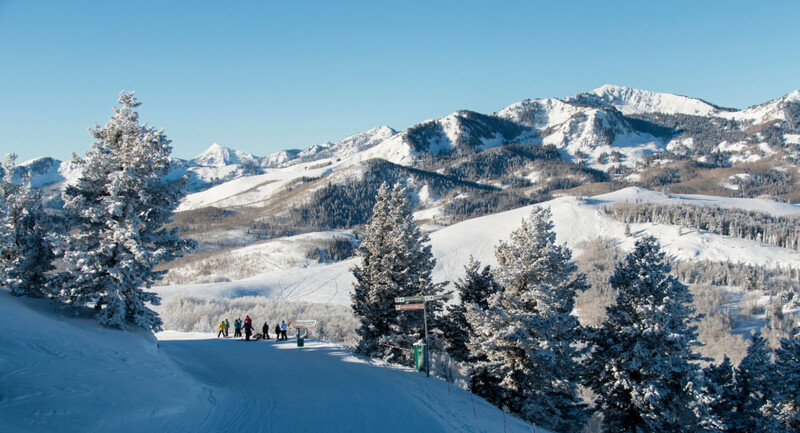 Homeward Bound, a green run winding down the slopes of Bald Mountain, offers stunning views of the Wasatch Range. The run is plenty long and mellow-paced, so skiers get a lot of bang for their buck. Meanwhile, Ontario gently descends from the summit of Flagstaff Mountain, taking beginners all the way down to Silver Lake Lodge, where they can enjoy a quick snack or lunch if they need to refuel. And the feel-good Success run offers beginners a lovely journey from the top of Bald Eagle Mountain to the resort’s main Snow Park Lodge, where families can meet and fuel up. Bald Mountain offers steeper groomed runs. Those ready for a bit more steepness can have a blast on the north-facing slopes of Bald Mountain, where the sun doesn’t interfere too much with the groomers’ handiwork from the night before. Keno, Nabob, and Legal Tender all descend from the mountaintop at a perfect blue pitch—and it’s worth getting up early for first chair to hit them up while they’re fresh and untouched. 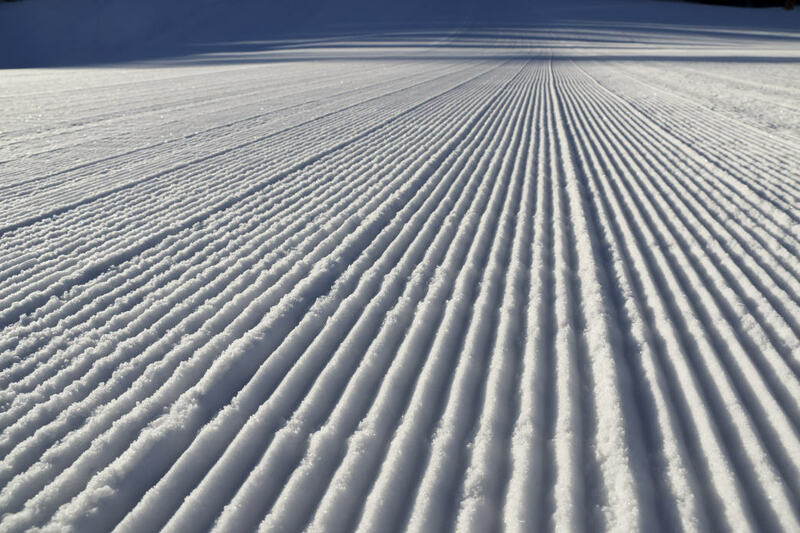 Their corduroy grooves await the swooshing carve of a skier’s edge, while the runs’ topography alternates between steeps and flatter portions, which gives the runs a roller-coaster type feel. Meanwhile, Stargazer, a blue run on Flagstaff Mountain, faces to the east. This means that it softens up just a touch in the morning sun, creating a buttery-smooth feel beneath your skis as you cruise down toward Silver Lake Village below. Advanced skiers will find plenty of groomed trails to enjoy as well. For those with the need for steeps, head to Bald Mountain and descend eastward on Morning Star. This ripper isn’t for the faint of heart, but when it’s freshly groomed, there’s nothing like it. The run is perched on the very edge of the resort, overlooking the Jordanelle Reservoir. Experts should also test their mettle on Bald Eagle Mountain’s Champion mogul run, famous for its reputation as an infamous championship mogul course on the competitive circuit. Since the moguls on this run have to be perfect, Deer Valley’s groomers measure out the cadence of the moguls, mark them with poles in the snow, and then groom deep divots between the moguls in a back-and-forth pattern. Then, local ski clubs and teams come ski the moguls over and over to smooth them out with their ski edges. The result: a perfectly consistent mogul course, groomed into perfection. After trying all these runs yourself, pat yourself on the back for choosing a resort that takes its cuisine and its conditions seriously, and head on in for a well deserved après-ski snack and beer. Compare notes on the best runs with new friends at the bar, and start plotting a whole new round of fun for the next day. On the first Ski day in the Park City area, Deer Valley always gives my confidence a big boost. After not skiing all summer, it is really wonderfull to point ’em and let them rip. These clean runs are the best for that. Looking forward to my trip at the end of February with the Texas Ski Council. Thank you for the kind words. We will make sure to pass your comment on to our mountain operations team. We look forward to seeing you on the slopes. I purchased a special ski just for Deer Valley groomers – the Blizzard Quattro RX! Love how the groomer team puts strategy into their process. Every day is just a little bit different for season pass holders and people on multiple day vacations. Skiing the groomers over the years at Deer Valley is always fun. I would often see Stein out there, too. Now, I like the steeps but it’s always fun to rip’em up on the greatest groomers in the world.